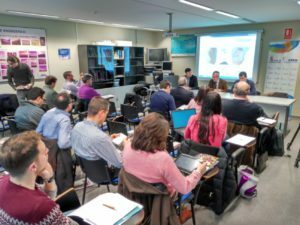 On the 15th of February, the Technological Institute of Castilla y León offered an EMSA workshop focused on the use of the EMSA web-tool. The workshop was hosted by the ITCL in cooperation with the EREN, a regional energy institution from Spain. Both public and private entities assisted to the workshop. Companies from sectors such as energy efficiency, water treatment, environment, food or dairy products were also present. The workshop’s aim was to get participants familiar with the EMSA web tool, as well as to train experts in their first step to become part of the Energy Angels Network. Out of almost 30 participants, the majority were technicians and engineers but also students and managers attended to the workshop. In the conference, the EnergyWater project and the Energy Angels Network were explained, along with the EMSA web tool. As one of the main results of the project, the Energy Management Self-Assessment (EMSA) web tool was presented as a free online platform that supports the evaluation and improvement of the energy efficiency of companies’ manufacturing processes in terms of water and energy, both from companies and experts’ perspective. This tool allows users to introduce information about their processes and the equipment they use. The EMSA tool will evaluate the company’s processes information and return a score that includes energy and water use efficiency, as well as a ranking against other companies. The EMSA enables companies to carry out benchmarking and bench-learning experiences in industrial efficiency water processes, at European level. Furthermore, each company can only access their own benchmarking results and their rank position. In order to achieve this objective, the Energy Angels Network was also presented during the workshop, focusing on its main advantages, such as helping companies to remove market barriers and increase energy efficiency, by providing them with good practices and tips on how to use new technologies. The assistants had the opportunity to test the tool, making a practical case study about the use of EMSA, including all its functionalities (introduce information, show results, identify improvement actions, benchmarking…). Finally, they also followed a training exam to become Energy Angels.A following workshop has been already scheduled to take place late March in Burgos, Spain. Stay tuned!.